After working on the causes of autism for almost 25 years, one of the most fascinating and puzzling aspects has been the marked increase in autism that has been noted over the last 30 years. To qualify as a cause of autism, the factor needs to be something that did not exist at the beginning of the trend upward, but has steadily increased in step with the increase in autism. In addition, the factor needs to piece together many of the other biochemical factors that have been confirmed over the years. One of the most significant factors reported almost 40 years ago in an article in Acta Psychiatrica Belgica, is the presence of high amounts of the dopamine metabolite, homovanillic acid (HVA), in urine samples of children with autism. Dopamine is an extremely important neurotransmitter in the brain. Neurotransmitters are substances that relay electrical signals from one part of the brain to another part. Furthermore, this groundbreaking article confirmed that the degree of autism severity was related to how high the dopamine metabolite level was. The higher the dopamine metabolite level in the child’s urine, the greater the severity of symptoms in the child. This article was also confirmed in a second study. However, these studies were virtually completely ignored by researchers until I found them and realized their significance. This information made clinical sense since drugs that inhibit excessive dopamine have been used for many years to treat the most severe symptoms of autism, such as aggression to others or self-aggression like head-banging or self-biting. The first drugs used for these symptoms were a class of drugs called neuroleptics. The earliest drugs of this type were called phenothiazines, which were largely replaced with a drug called haloperidol (Haldol™), and finally resperidone (Risperdal™). 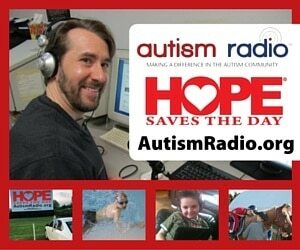 Why would individuals with autism have high amounts of dopamine? In 2010, I published work that indicated that individuals with autism had a high amount of a substance identified as 3-(3-hydroxyphenyl)-3-hydroxypropionic acid (HPHPA) in their urine samples. Furthermore, HPHPA is a metabolite of Clostridia bacteria, which are markedly elevated in autism. When I first published the discovery of the molecule in high amounts in urine samples of children with autism, I suspected the molecule had something to do with interfering in the metabolism of neurotransmitters. This work confirming high HPHPA in autism has now been documented throughout the world in China, Turkey, and Italy. In 2016, I published the work that found the reason HPHPA and dopamine are connected. HPHPA inhibits the conversion of dopamine to norepinephrine, which requires the enzyme dopamine-beta-hydroxylase (DBH). Certain phenols such as HPHPA and others prevent DBH from working. As a consequence, dopamine may build up to extremely high abnormal levels and convert to toxic metabolites of dopamine that alter the structure and function of the brain. This alteration may be permanent if not stopped soon enough by controlling Clostridia with effective probiotics or antibiotics specific for Clostridia. This connection between Clostridia and elevated dopamine is so prevalent in autism that elevation of Clostridia species is almost surely the major cause of severely abnormal behavior in autism. Any time a physician recommends that your child has such severely abnormal behavior that Risperdal™ is needed, I would strongly recommend you using The Great Plains Laboratory’s urine Organic Acids Test (OAT) for measuring Clostridia metabolites such as HPHPA and others. The side effects of Risperdal™ are very severe and may include obesity, growth of breasts in boys, diabetes, and severe neurological problems. I do not recommend stool testing for Clostridia since no current stool tests can differentiate species of Clostridia that produce chemicals that cause high dopamine. Now the next question arises. Why do children with autism have high amounts of Clostridia bacteria in their intestines to begin with? The likely answer is the proliferation of the weed killer (herbicide) called glyphosate which is sprayed on food plants like corn and soy, which have been genetically modified to be resistant to glyphosate. Such plants are called genetically modified organisms (GMO). When corn fields containing a variety of weeds are sprayed, the weeds die, but the corn is not killed. However, the corn will contain high amounts of the glyphosate chemical. This chemical is not something you can wash off before eating. The glyphosate is spread throughout the corn plant, not only on the surface. The makers of the GMO corn claimed that humans didn’t have to worry about glyphosate since humans do not have the biochemical systems present in almost all plants and weeds. The flaw in their reasoning is that almost all the beneficial bacteria (probiotics) in the intestines of humans and farm animals such as cows and turkeys are killed by glyphosate, while extremely pathogenic bacteria like Salmonella and Clostridia, which are resistant to glyphosate proliferate, produce toxins like HPHPA. 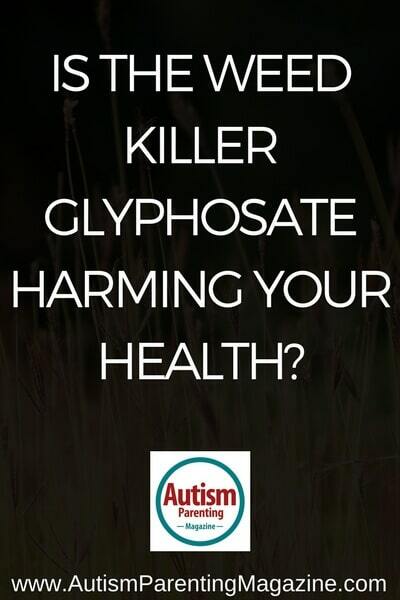 If the introduction of glyphosate causes marked increases in autism, it would be expected that the increased incidence of autism would track or correlate with glyphosate usage. This is indeed the case, as shown in Figure 1. What can be done about this problem? To avoid glyphosate, children and breastfeeding mothers should only eat food labeled as organic. Food labeled as non-GMO may still be contaminated with glyphosate as well as other herbicides and pesticides and should be avoided. If your child already has symptoms of autism, I would recommend having his/her urine tested for toxic chemicals with our GPL-TOX Profile and our Glyphosate Test, as well as the Organic Acids Test for presence of Clostridia bacteria metabolites and high dopamine metabolites. These tests will help you get the proper treatment for your child as well as serve for legal documentation of the factors causing your child’s autism when the governments and companies approving glyphosate are finally brought to task for their negligence. A diagram summarizing all of these factors is shown in Figure 2. A recent case study of mine on triplets nicely summarizes these factors. The triplets evaluated (two boys and a girl) all had extremely high amounts of glyphosate in their urine samples (25.5 times the median value of the lab’s reference range). The two boys were diagnosed with autism while the girl had a suspected seizure disorder and impaired growth and weight gain. The two boys both had high amounts of dopamine metabolite and high Clostridia metabolites. The children did not eat organic food, and also ate daily a significant number of corn tortillas from nonorganic corn. After switching to an organic food diet for six weeks, there was a 94 percent reduction in urine glyphosate in the child with autism who was retested. In addition, the mother reported that all of the children functioned better and the autism treatment provider reported the removal of an apraxia diagnosis and speech improvement in one of the children. Shehata AA, Schrödl W, Aldin AA, Hafez HM, Krüger M. The effect of glyphosate on potential pathogens and beneficial members of poultry microbiota in vitro. Curr Microbiol. 2013;66(4):350-358. Krüger M, Shehata AA, Schrödl W, Rodloff A. Glyphosate suppresses the antagonistic effect of Enterococcus spp. on Clostridium botulinum. 2013; 20:74-78. Rulff R, Schrödl W, Basiouni S, Neuhaus J, Krüger M Is downer cow syndrome related to chronic botulism? Pol J Vet Sci. 2015;18(4):759-765. Rodloff AC, Kruger M. Chronic Clostridium botulinum infections in farmers. Anaerobe. 2012;18(2):226-228. Shaw W. Clostridia bacteria in the gastrointestinal tract as a major cause of depression and other neuropsychiatric disorders. In Greenblatt J, Brogan K, eds. Integrative Psychiatry for Depression: Redefining Models for Assessment, Treatment, and Prevention of Mood Disorders. New York, NY: Taylor and Francis; 2016:31-48. Shaw W. Increased urinary excretion of a 3-(3-hydroxyphenyl)-3- hydroxypropionic acid (HPHPA), an abnormal phenylalanine metabolite of Clostridia spp. in the gastrointestinal tract, in urine samples from patients with autism and schizophrenia. Nutr Neurosci. 2010;13(3):135-143. Keşli R, Gökçen C, Buluğ U, Terzi Y. Investigation of the relation between anaerobic bacteria genus Clostridium and late onset autism etiology in children. J Immunoassay Immunochem. 2014;35:1:101-109. Swanson NL, Leu A, Abrahamson J, Wallet B. 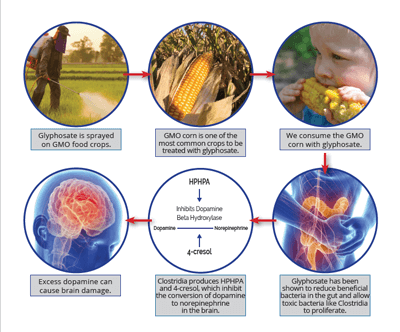 Genetically engineered crops, glyphosate, and the deterioration of health in the United States of America. J Organic Syst. 2014;9(2):1. Goodhart PJ, DeWolf WE, Kruse LI. Mechanism-based inactivation of dopamine β-hydroxylase by p-cresol and related alkylphenols. Biochemistry. 1987;26:2516-2583. Garreau B, Barthelemy C, Domenech J, et al. Disturbances in dopamine metabolism in autistic children: Results of clinical tests and urinary dosages of homovanilic acid (HVA). Acta Psychiatr Belg. 1980;80(3):249-265. Kałużna-Czaplińska J, Socha E, Michalska M, Rynkowski J. Urinary level of homovanillic acid and mercury in autistic children. Toxicol Environ Chem. 2011;93(1):199-206. Figure 2. 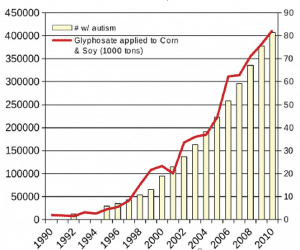 Proposed mechanism by which glyphosate causes autism. William Shaw received a PhD in biochemistry, genetics, and human physiology from the Medical University of South Carolina and is board-certified in the fields of clinical chemistry and toxicology. He supervised testing at the Centers for Disease Control and Prevention and SmithKline Beecham Clinical Laboratories. He was Director of Clinical Chemistry, Endocrinology, and Toxicology at Children’s Mercy Hospital, the teaching hospital of the University of Missouri at Kansas City School of Medicine. He is now the director of The Great Plains Laboratory in Lenexa, Kansas, that offers worldwide testing for abnormal metabolic diseases and for metal and nonmetal toxic chemicals, metabolites from yeast and bacteria, opiate peptides from wheat and milk, mycotoxins, and food allergies. Many of these are important in autism and PDD. 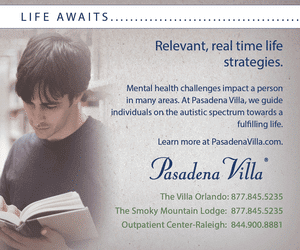 Dr. Shaw has published two books on autism treatments: Biological Treatments for Autism and PDD. What’s going on? What can you do about it? 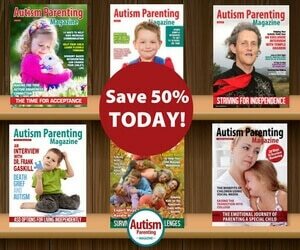 and Autism: Beyond the Basics. 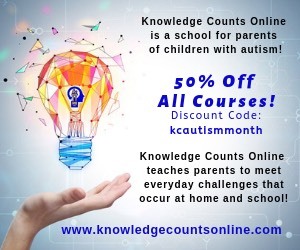 He estimates that his laboratory has tested samples of more than 100,000 people with autism in most of the countries in the world and has presented seminars to parents and physicians on the causes and treatments of autism throughout the world.